Creative dissatisfaction with the status quo needs to be nurtured relentlessly. Encourage both individual and team creativity, facilitate cross-pollination of ideas. Play simulation games with promising ideas to inspire next waves of entrepreneurial creativity, intellectual teamwork and smarter venturing. Unlock true potential of the community of people as a whole and each its member. Create an inspiring vision, set stretch goals, encourage people to experiment with breakthrough ideas and to achieve what may seem impossible. Leverage and synergize diversities. Facilitate multicultural collaboration, cross-pollination of ideas and intellectual teamwork. 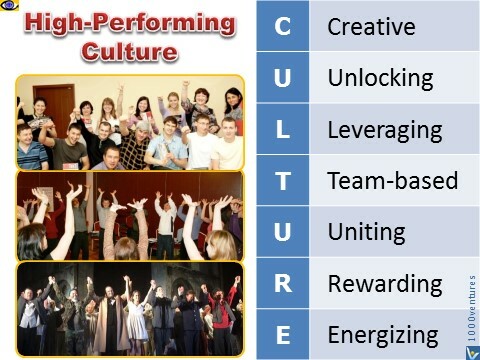 Team cultures flourish, exclusive cultures perish. Ensure that individual members both demonstrate their best talents and function synergistically as a unit to achieve common goals. Reward achievement-focused behavior and results. Money does matters, but great achievers respond more keenly to rewards for the heart such as doing great things together, achievement of stretch goal, acknowledgment of the contribution made, and praise by those whose expertise is admired. Energize people, boost their self-esteem, broaden the horizons, provide exciting challenges and big opportunities.